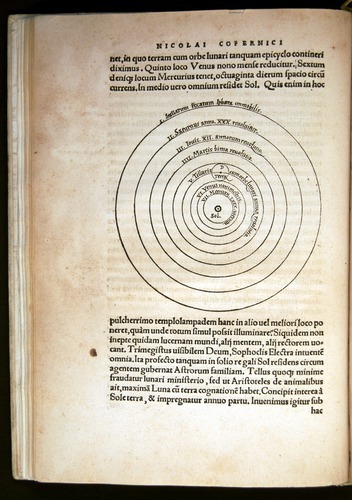 Ptolemy’s Almagest, the most important work of astronomy for nearly 1500 years, suggests both the richness of the History of Science Collections’ holdings and the need to maintain active acquisitions. The Collections hold more than 50 works of Ptolemy, not counting digests and commentaries by other writers. 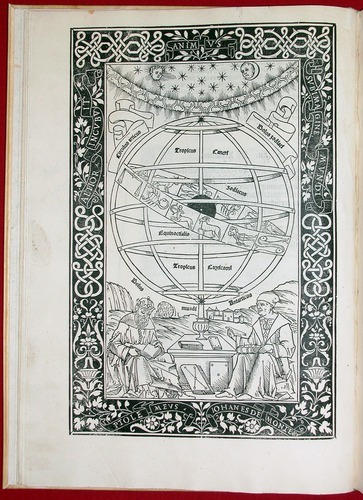 Yet the most important edition of Ptolemy’s Almagest — the one used by Renaissance astronomers such as Copernicus — was an Epitome published by Regiomontanus in 1496. For 50 years this Epitome was one of the most significant items missing from the Collections. However, in December 2002, the Collections acquired a copy in excellent condition of this long-sought work. Regiomontanus, Epitome of Ptolemy’s Almagest (1496), frontispiece. Claudius Ptolemaios, one of the greatest astronomers of all time, lived in Alexandria, Egypt, in the middle of the second century A.D. In the Mathematical Syntaxis, Ptolemy synthesized and extended the accomplishments of ancient Greek and Babylonian mathematical astronomy. Written in Greek, Ptolemy’s book was titled Almagest (“The Greatest”) by its Arabic translators. Regiomontanus, Epitome of Ptolemy’s Almagest (1496), title page. 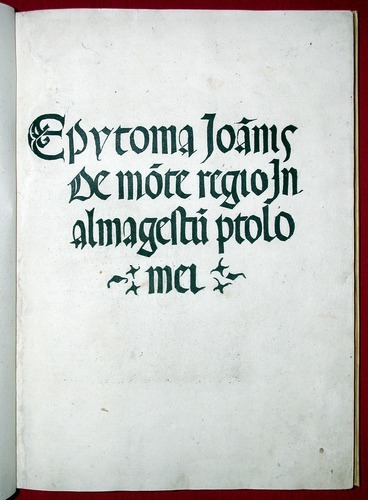 The title page announces that the Epitome of Ptolemy’s Almagest was prepared by “Joannes de Monte regio,” the Renaissance astronomer Regiomontanus. An epitome of Ptolemy’s Almagest, based upon a Greek manuscript belonging to Cardinal Johannes Bessarion, appeared in 1496. This remarkable book was the first printed edition in any form of Ptolemy’s Almagest, and its only printing in the 15th century. Begun in 1460 by the great Renaissance astronomer Georg Peurbach, at Bessarion’s request, the Epitome was completed by Peurbach’s student Regiomontanus not long after Peurbach’s death in 1461. Regiomontanus hoped to publish the Epitome with his own press in Nuremberg, but his premature death delayed its appearance for 20 years. Far from merely introducing Ptolemaic astronomy like earlier textbooks, the Epitome was a major contribution to Renaissance astronomy. As a detailed commentary organized on the same plan as the Almagest, it contained new techniques, methods, observations and critical reflections. 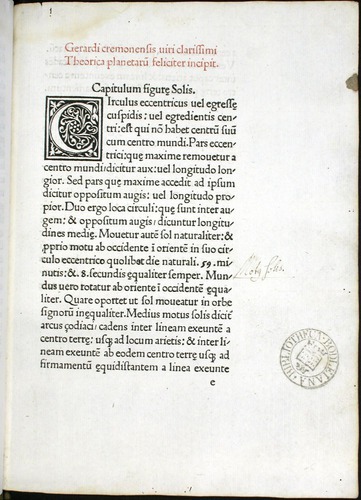 For example, at the end of Book V, Section 22, Regiomontanus called attention to the astonishing fact that Ptolemy’s lunar theory required the Moon occasionally to appear four times its usual size. This impossible wonder arrested the attention of Copernicus. the Epitome served as the fundamental treatise on Ptolemaic astronomy until the time of Kepler and Galileo, and remains the best exposition . . . next to the Almagest itself. Although it runs to about half the length of the Almagest, the Epitome is nevertheless a model of clarity and includes everything essential to a working understanding of mathematical astronomy — and even manages to clarify sections in which Ptolemy omits steps or is somewhat obscure. It has not been superseded even by the excellent modern commentaries on the Almagest, and the mathematical astronomy of the sixteenth century is in places unintelligible without it. The Epitome is the true discovery of ancient mathematical astronomy in the Renaissance because it gave astronomers an understanding of Ptolemy that they had not previously been able to achieve. Copernicus used it constantly, sometimes in preference to the Almagest; and its influence can be seen throughout the De revolutionibus. Regiomontanus, Epitome of Ptolemy’s Almagest (1496). In the 21st century, the Epitome of Ptolemy’s Almagest is one of three landmark books that appear on any short list of extremely rare and essential works in the history of early modern astronomy. 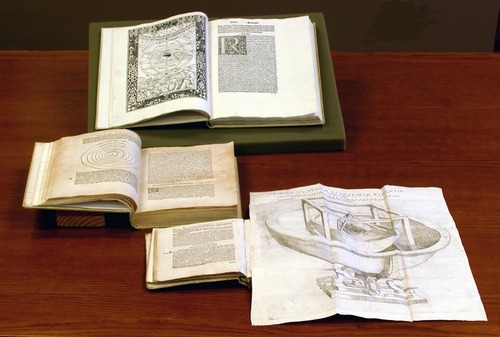 Three Treasures: For the history of astronomy, the 16th century began in 1496 with the Epitome of Ptolemy’s Almagest (top), reached its mid-point with Copernicus’ De revolutionibus (middle, 1543), and ended with Kepler’s Mysterium cosmographicum (below, 1596), published exactly 100 years after the Epitome. Gerard of Cremona, Theorica planetarum, in Sacrobosco, Sphaera (1478). 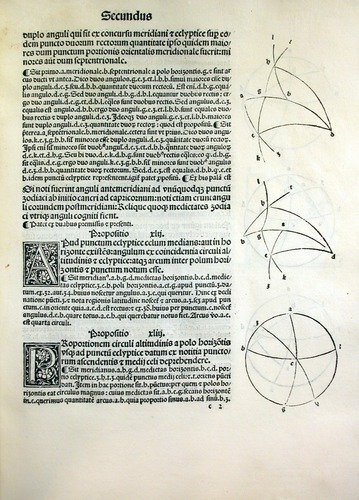 Gerard of Cremona’s Theorica planetarum offered a simple introduction to Ptolemaic planetary calculations, and became the major astronomy textbook of the middle ages. 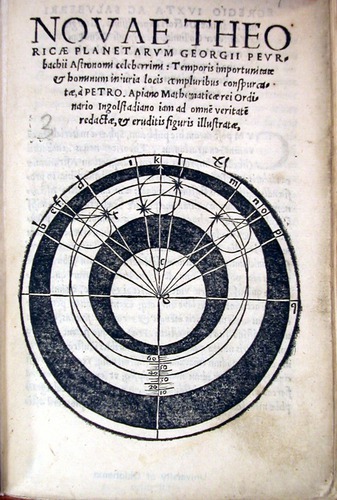 Georg Peurbach, Novae theoricae planetarum (Venice, 1534). In the 15th century, Peurbach’s Theorica novae planetarum replaced Gerard of Cremona’s Theorica planetarum as the standard introduction to Ptolemaic planetary astronomy. Peurbach’s student Regiomontanus published the first edition of Peurbach’s Theorica novae planetarum in 1472. 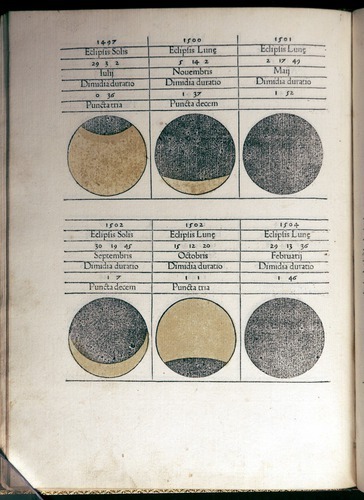 Regiomontanus, Kalendarium (Venice, 1476), Table of eclipses. The Kalendarium of Regiomontanus was the earliest printed work to include a date on the first page – an ancestor of the title page. Published in 1476 by Erhard Ratdolt, it predicted the positions of the Sun and Moon for 40 years. Columbus took an earlier German edition on his fourth voyage, and used its prediction of the 1504 lunar eclipse (shown here) to frighten his Jamaican hosts. Regiomontanus wrote a number of other important astronomical works, including a study of trigonometry dedicated to his friend and patron Cardinal Johannes Bessarion, Archbishop of Nicaea. Nicolas Copernicus, De revolutionibus orbium coelestium (1543), cosmic section. View entire De revolutionibus here. Without the Epitome of 1496, Renaissance astronomy and the Copernican Revolution would have been inconceivable. Copernicus overthrew the Earth-centered Ptolemaic system, placing the Sun at rest in the center of the universe, and setting the Earth in motion around the Sun as a planet. 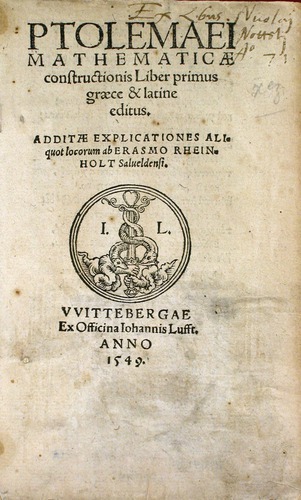 This 1549 edition featured both Greek and Latin texts of Book I, with commentary by Erasmus Reinhold, who strengthened Ptolemy’s arguments against the motion of the Earth (although elsewhere he adopted Copernicus’ mathematical models).